Ron Shimek recently showed that two salt mixes and natural seawater were more conducive to the development of sea urchin embryos than were two other salt mixes.1 He went on to suggest that elevated metal levels, such as copper, could have been responsible. While there are many possible explanations for the results that he obtained, elevated metals is a possibility that has piqued the interest of many reefkeepers. In a follow-up article I showed that there are many sources of metals in operating reef aquaria that may exceed that from salt mixes.2 One of the largest potential sources is from calcium and alkalinity supplements, for example CaCO3/CO2 reactors.2 I also made the claim that limewater might be a better choice if the goal is to maintain lower metals levels in reef aquaria.2 Thisarticle expands on the basis of that claim, and provides some experimental data that demonstrates how limewater may be able to deliver lower quantities of some metals. The FCC specification for food grade lime states that it can contain up to 30 ppm heavy metals. The tap water that some aquarists use can contain up to1.3 ppm copper without violating US EPA regulations. But the copper levels present in natural seawater are sub-ppb (parts per billion), and many aquaria seem to operate in the range of 10-40 ppb.2 Consequently, adding limewater that contains 1 ppm copper would be a substantial addition to many aquaria. So the claim that limewater may be a good choice if low metals are desired is not based on the absence of metals from in ingredients for limewater. Fortunately, limewater is somewhat self-purifying in that copper and other metals may not be especially soluble under the conditions present in limewater (high calcium and hydroxide, and often with CaCO3 and Ca(OH)2 particulates present). In fact, some aquarists have reported that blue crystals collect in the residue present on the bottom of their limewater reservoir or Nilsen reactor. Such colored compounds are certainly heavy metals, and could well be copper. But how exactly does this precipitation take place? When I first started to investigate this issue, I thought it was rather straightforward: the metal hydroxides and oxides are insoluble, so at pH 12.4 (as in limewater),3 they will simply precipitate. Well, that turned out to be the “introduction to chemistry” approach that also turned out to be overly simplistic and wrong. Then on looking more in-depth, I found procedures for determining the solubility of metals as a function of pH. Of course, that too turned out to be too simplistic and wrong for a heterogeneous mixture like limewater. In the end, I believe that I can report how and why limewater is self purifying, at least for copper and probably for certain other metals as well. Beyond understand how limewater functions, this article will also lead the reader through some of the pitfalls that arise in trying to understand complex systems from simple chemical ideas. At the very least, aquarists reading this article will know to be more critical of chemical ideas that seem reasonable, but may not be true. Figure 1. Copper sulfate solution before (left) and immediately after the addition of calcium hydroxide (right). Consequently, there is little difference between using CaO and Ca(OH)2 except that CaO gives off a significant amount of heat when it hydrates. When these materials dissolve, they dissociate to calcium ions (Ca2+) and hydroxide ions (OH–). Limewater also contains particulates that are critical for understanding how metals are removed from solution. In addition to undissolved calcium hydroxide, limewater often contains calcium carbonate particulates that arise from the reaction between atmospheric carbon dioxide and the limewater. This calcium carbonate can be seen as a solid crust on the surface of limewater that has been exposed to the air for a day or two. It also collects on the bottom of the container. How these particulates play a role in metal removal from limewater will be shown in subsequent sections of this article. Saturated limewater contains approximately 1.1 grams of CaO (1.5 grams of Ca(OH)2) per liter (that is, per 1000 grams of liquid).3 So if a soluble impurity is present in calcium oxide at 10 ppm, then it will be present in the final limewater at 10 ppm x 1.1 grams/1000 g = 0.011 ppm. Consequently there is a dilution factor of 900 between solid calcium oxide and saturated limewater. The calcium oxide that I use for my aquarium from the Mississippi Lime Company is food grade, but still has many impurities. Table 1 shows their typical analysis and also shows the concentration in the limewater that would result if all of each of those impurities were to dissolve into the limewater. Notice that the “typical analysis” of the calcium oxide contains 2ppm heavy metals, 0.1% aluminum, 12 ppm manganese, and less than 0.5 ppm lead. Table 2 shows the total impurities that would be added to the aquarium over the course of a year assuming that one were adding 2% of the aquarium volume in saturated limewater (0.0204 moles/L CaO) every day. Table 2. Cumulative amount of certain metals added to a reef aquarium over the course of a year using limewater if all of the impurities in the calcium oxide went into the aquarium. Table 3 shows the total impurity levels allowed in food grade calcium oxide. These values are substantially higher than the typical analysis shown in Table 1 (3-15 fold higher). Consequently, the amount of potential impurities in the limewater and the amount delivered to the tank can be substantially higher than shown in Table 2. In addition to the lime itself, metal impurities can also arise from the water used. Many aquarists use deionized water. If properly deionized, such water should not contain significant metal impurities. However, some aquarists use tap water, and tap water can be a much larger source of metals. Table 4 shows the amount of certain metals that can be contained in drinking water (according to the US EPA). By this measure, the amount of lead and copper entering limewater from tap water could be much higher than from the lime itself (Table 1 where copper would be covered under total heavy metals). Limewater may be a useful way to add calcium and alkalinity to a reef tank while adding a minimal amount of certain heavy metals. This result is not necessarily because the starting calcium hydroxide or oxide is especially low in impurities (it might contain up to 1.3 ppm copper as shown in Table 4), but because it may be self-purifying if used correctly. There are many metals that aquarists might be concerned with in the context of toxicity. Copper is one that is known to be quite toxic to invertebrates, and will be used in some of the experiments in this article as a surrogate for metals in general. Some will, of course, have very different chemical and biological properties than copper, but it is an appropriate place to start. Figure 2. Copper sulfate solution before (left) and several hours after the addition of calcium hydroxide (right). Of course, analytical techniques are much better now than they were in 1908, and the solutions that the US Department of Agriculture thought to be “free” of copper still contain some dissolved copper at low levels, but much less than the initial solutions. I repeated this experiment myself, both to provide a nice picture of the effect as well as to permit the use of modern analytical techniques on the resulting solutions. The left hand side of Figure 1 shows a copper sulfate solution containing 2860 ppm copper. It is tinted slightly blue from the copper in solution. After addition of solid calcium hydroxide to it, the solution turns a much more intense blue (right hand side of Figure 1). 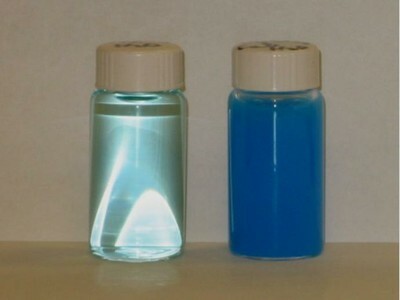 The color intensity change happens because the intensity of the color from copper solutions and salts is quite dependent on the nature of the ions present, and copper hydroxide is more strongly colored than aqueous copper sulfate. 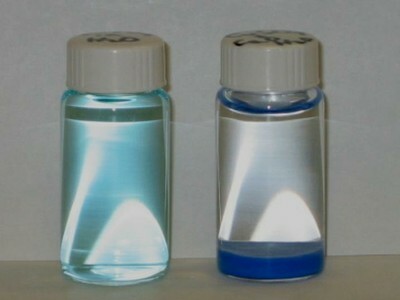 After allowing the solid precipitates to settle it is apparent that much of the copper is now bound into the solids, and the remaining liquid retains no blue tint from the copper ions (Figure 2). The copper concentration used in the experiment shown in Figures 1 and 2 is very high, far higher than an aquarist will ever encounter in the normal use of limewater. The high concentration was chosen to permit simple visualization, but the experiment can be repeated with more appropriate concentrations using analytical techniques to show the changes. Before getting to those experiments, however, it is worthwhile to try to understand what has happened in that experiment based on the known properties of copper and limewater. It turns out that at high pH, many metals form insoluble hydroxide and oxide salts. In fact, high pH is a generally useful way to precipitate or limit the solubility of many metals.12-16 If the limewater solution is allowed to settle so that only clear limewater is dosed, then these insoluble hydroxide salts will precipitate from solution and collect on the bottom of the limewater reservoir. For example, copper in the starting lime (or in the water used to make it) may precipitate as copper hydroxide. The following two sections go into detail on the mathematical treatments of metal solubility. For aquarists not interested in such discussion, it is reasonable to skip down to the section titled “Precipitation of Copper from Limewater: Experimental Results”. How effective is this precipitation? At first glance, that result sounds great! A copper concentration of 3.5 x 10-17 M is equivalent to 0.0000000000022 ppm. So the free copper ion concentration present in limewater is incredibly low. Problem solved. Right? Unfortunately, no. Not solved. Equation 14 correctly shows the concentration of the copper ion, Cu2+, in solution in limewater. However, it is not the only soluble species of copper than can be present. In fact, there are other species that can dissolve, including both Cu(OH)2 and Cu(OH)3-. Determining the solubility of these species is much more complex. In the textbook “Aquatic Chemistry Concepts”, Pankow goes into great detail on how to calculate all of the necessary solubilities from known constants, though the procedure is tedious.4 The total solubility values were worked out for a variety of metals in a recent literature article by Dyer et al.17 They showed solubility as a function of pH for iron (III), iron (II) aluminum, chromium (III), copper, nickel, cobalt (II), cadmium, lead, magnesium, calcium, and zinc. 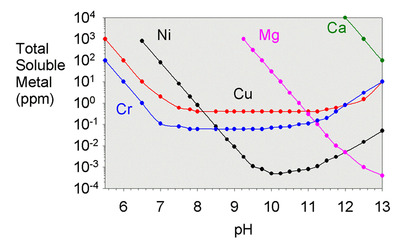 A plot showing their results for copper is shown in Figure 3 and for a variety of other metals in Figure 4. Figure3. The total solubility of copper in water as a function of pH. Figure 4. The total solubility of several metals in water as a function of pH. 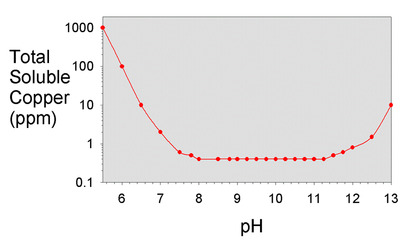 As can be seen in Figure 3, the total solubility of copper is steady at about 400 ppb between pH 8 and pH 11, with higher solubility above and below that range. At pH 12.4 (limewater), the solubility is about 2 ppm. Consequently, at this pH, the addition of limewater would not be expected to limit the solubility substantially unless the copper concentration was higher than 2 ppm. Since tap water and food grade lime should not contain more than 1.3 ppm of copper, this result suggests that limewater will not precipitate any copper under normal conditions that an aquarist might encounter (barring the use of low grade lime or well water with high copper levels), and limewater will consequently not be self-purifying with respect to copper. Of course, if that were the end of the story, there would be little reason for this article. Other processes apparently do result in precipitation of copper from limewater, and these are shown experimentally in later sections, along with explanationsof how that can happen. Likewise, the limiting solubilities for a variety of other metals are shown in table 5.17 Most of these are not likely to come into play in the purification of limewater unless it is very contaminated to begin with. One exception is magnesium. Regardless of how much magnesium is present in the limewater to begin with, it will nearly all precipitate from solution, and clear limewater is not a source of magnesium for an aquarium. The fact that a number of aquarists have reported blue precipitates in their limewater residue suggested to me that there may be something more to this story. Sure, they could have been using especially impure lime, or had especially impure source water. Nevertheless, it was easy enough for me to run some experiments to see what was really happening. In all of the experiments to follow, I monitored copper concentrations using a modern analytical lab technique: Inductively Coupled Plasma (ICP) using atomic emission detection. I used two different emission peaks (324.754 and 327.395 nm). To start, I made a solution of 1.0 ppm copper as copper sulfate (ACS reagent grade) in deionized water (700 mL). It had no detectable color by eye. When this sample was analyzed by ICP, it had an easily quantified set of emission peaks for copper, and this emission intensity was used as a standard (1.0 ppm). To this solution I added 2.4 grams of calcium hydroxide (ACS Reagent Grade) and stirred it on a magnetic stirrer for 1 hour. This amount of lime is far more than necessary to saturate this solution (which would take just over 1 g of Ca(OH)2). The solution then settled for 24 hours, and a slightly cloudy sample was removed. This sample was analyzed and found to contain 340 ppb copper before filtration and 133 ppb copper after filtration through a 0.45mm polypropylene syringe filter. The value of 133 ppm copper represents a droop of 87% in the copper concentration. The original solution was allowed to continue settling for 6 days total, and another sample was withdrawn. This sample was found to contain 160 ppm copper before filtration and 125 ppm copper after filtration through a 0.45mm polypropylene syringe filter. Additional calcium hydroxide was added to the original solution (2 g/600 mL), the solution was stirred for an hour, and the solution was allowed to settle for 24 hours. This sample was found to contain 33 ppb copper before filtration and 25 ppb copper after filtration through a 0.45mm polypropylene syringe filter. The value of 25 ppb copper represents a drop of 80% from the 125 ppm copper solution just before this second lime addition, and a total drop of 97.5% from the initial copper sulfate solution. As a control, I tested a solution of calcium hydroxide (2 g/50 mL of deionized water) without any copper sulfate added. In analyzing this sample, I could detect no real signal from copper, either before or after filtering. This result implies that the “natural” copper concentration in these samples is below about 10 ppb. Clearly, the first addition of excess calcium hydroxide dropped the copper concentration from 1 ppm to 133 ppb even though 133 ppb is below the solubility of copper at ANY pH according to literature values.17 Likewise, the addition of a second portion of solid calcium hydroxide to the solution, which should not have impacted the pH at all as there was already substantial excess solid calcium hydroxide before the second addition of solid lime, dropped the concentration from 125 ppb to 25 ppb. The first result might be explained simply by errors in the literature values or on my part. The Dyer et al article shows that these calculations can be off and should be used as a guide rather than a strict value.17 But the second drop is really only consistent with an entirely different phenomenon: that of surface absorption or coprecipitation. The binding of metals to the surface of inorganic materials, such as calcium carbonate, iron oxide or hydroxide, alumina, and clay (e.g., kaolin) is well known.33-44 In this case, both calcium carbonate and calcium hydroxide are present in these solutions, and these minerals provide surfaces to which copper and other metals may absorb strongly. Additionally, as CaCO3 is precipitated in such mixtures, copper and other metals are likely to get incorporated into the growing crystals, further lowering the solution metal concentration. Consequently, the purification of limewater may not be entirely driven by pH, but also by the presence of “clean” mineral surfaces to which impurities such as copper will adhere. Copper can be precipitated from limewater and thereby the amount delivered to aquaria may be less than would be suggested by the amount of copper in the solid lime or in the source water. Some of this precipitation may come from simple precipitation of copper hydroxide, and some may come from precipitation onto the surface of the solid calcium hydroxide and calcium carbonate present in the solution. Since both copper and other metals are known to bind to these types of surfaces, it is reasonable to expect that this is what happens during limewater use by aquarists. As a follow up to this work, I am studying the adherence of copper and other metals to calcium carbonate surfaces. Aquarists may, for example, be able to lower the metals concentrations in limewater and even in artificial saltwater simply by mixing it with calcium carbonate prior to use. Adding calcium carbonate sand to the bottom of a reservoir of limewater or artificial saltwater, for example, may provide some purification. I’ll report on the results of those experiments in future articles. The Action of Lime in Excess on Copper Sulphate Solutions. Bell, J. M.; Taber, W. C. Bur. Soils, U. S. Dept. Agr, J. Physic. Chem. (1908), 11 632-36. Recovery of copper from spent etching solution containing copper chloride. Tatsumi, Kenji; Wada, Shinji; Yukawa, Yasuhiro. (National Institute of Advanced Industrial Science and Technology, Japan; Mitsubishi Corporation). Jpn. Kokai Tokkyo Koho (2002), 5 pp. Heavy metals in wastewater: modeling the hydroxide precipitation of copper(II) from wastewater using lime as the precipitant. Baltpurvins, K. A.; Burns, R. C.; Lawrance, G. A. The Department of Chemistry, The University of Newcastle, Newcastle, Australia. Waste Management (Oxford) (1997), Volume Date 1996, 16(8), 717-725. Effects of lime treatment on fractionation and extractabilities of heavy metals in sewage sludge. Hsiau, Ping-Chin; Lo, Shang-Lien. Graduate Inst. Environmental Eng., Natl. Taiwan Univ., Taipei, Taiwan. Journal of Environmental Science and Health, Part A: Environmental Science and Engineering & Toxic and Hazardous Substance Control (1997), A32(9 & 10), 2521-2536. Prevention of copper dissolution from city water pipes by pH control. Tateishi, Keiichiro; Inoue, Michio; Hirose, Kenichi. Japan. Osaka-shi Suidokyoku Komubu Suishitsu Shikensho Chosa Hokoku narabini Shiken Seiseki (1975), Volume Date 1972, 24 38-42. Precipitation of tin(IV) from hydrochloric acid solutions by calcium hydroxide. Toptygina, G. M.; Evdokimov, V. I.; Eliseeva, N. A.; Badanin, V. S. Inst. Obshch. Neorg. Khim. im. Kurnakova, Moscow, USSR. Zhurnal Neorganicheskoi Khimii (1978), 23(6), 1471-6. Redox precipitation of nickel from aqueous solution using neutralization and hydrogen. Fugleberg, Sigmund; Haemaelaeinen, Matti; Knuutila, Kari. (Outokumpu Oyj, Finland). PCT Int. Appl. (2001), 17 pp. Precipitation of hydroxides and hydroxocarbonates of iron, nickel, and copper from wastewaters and process liquors. Maksin, V. I.; Valuiskaya, E. A. Inst. Kolloidn. Khim. Khim. Vody im. Dumanskogo, Kiev, USSR. Khimiya i Tekhnologiya Vody (1989), 11(1), 12-25. Purification of wastewaters containing heavy metals ions. Galitskii, N. V.; Sukhareva, N. I.; Lyakhovskaya, T. G. Institute of Technology, Mogilev, Belarus. Gal’vanotekhnika i Obrabotka Poverkhnosti (1993), 2(6), 52-5. Solubility of cobalt(III) hydroxide and stability constant of the hydroxy complex Co(OH)30 in aqueous solutions. Savenko, V. S.; Savenko, A. V. Geograf. Fak., Mosk. Gos. Univ. im. M. V. Lomonosov, Moscow, Russia. Geokhimiya (1999), (4), 443-445. The pH of formation of cobalt hydroxide and carbonate. Chernobrov, S. M.; Kolonina, N. P. Zhur. Priklad. Khim. (1956), 29 704-8. Manufacture of cobalt hydroxide. Nabeshima, Joji; Kawamata, Hiroshi. (Sumitomo Metal Mining Co., Ltd., Japan). Jpn. Kokai Tokkyo Koho (1985), 3 pp. A practical guide for determining the solubility of metal hydroxides and oxides in water. Dyer, James A.; Scrivner, Noel C.; Dentel, Steven K. E.I. DuPont de Nemours and Co., Wilmington, DE, USA. Environmental Progress (1998), 17(1), 1-8.